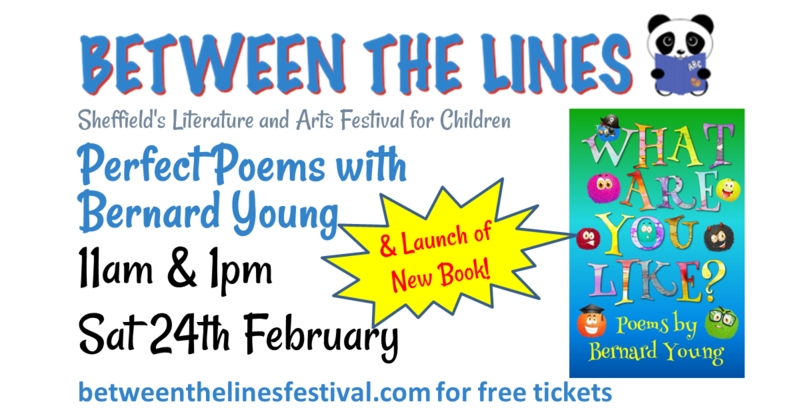 I will be launching my new book of poems for children on Saturday 24th February at the Between The Lines Festival in Sheffield. I will also be doing 2 performances and workshops for families, so if you are in the Sheffield area, please come along. The new book is titled “What Are You Like?” after the poem below. To order a copy send a message on the form on the books page. I am delighted to announce that I have a new children’s poetry book coming out soon. “What Are You Like?” will be available from 23rd February, ready to show the world on World Book Day (1st March). We’ve just had a proof copy and it’s looking great. 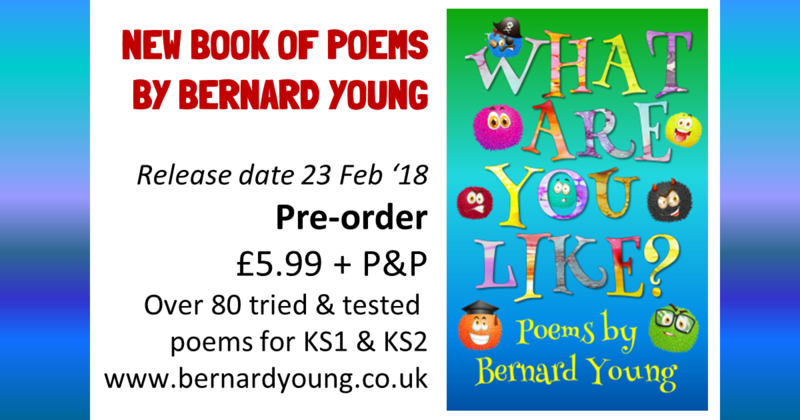 “What Are You Like?” has over 80 tried and tested poems that I regularly use in primary schools for poetry performances and workshops. Collected together from four books, several anthologies, together with some that haven’t been previously published. Funny, catchy, foot tapping, hand clapping, uplifting, lots of formats and lengths, something for everyone. There’s a sneak preview sample below. If you want to pre-order a copy to be sent as soon as they are available, please contact me for details. 2017 is the 20th year of World Book Day. It’s a celebration of authors, illustrators, books and (most importantly) it’s a celebration of reading. In fact, it’s the biggest celebration of its kind, designated by UNESCO as a worldwide celebration of books and reading, and marked in over 100 countries all over the world. 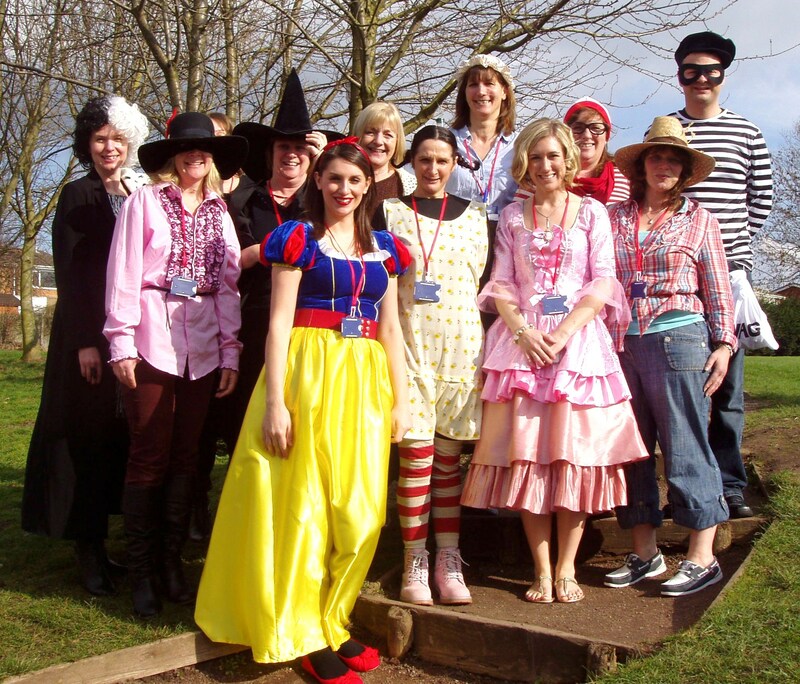 I’ve had some great visits to schools over the years in the week of World Book Day. Last year I visited seven schools just before and during World Book Day Week, mostly in Manchester where I am based. I blogged about it here. It is always fun to see how teachers and students dress up as characters from their favourite stories. Such as the teachers from Albrough Primary School in 2015 (read more) and Oldfield Primary School, gosh was that one really 2012? (Read more). 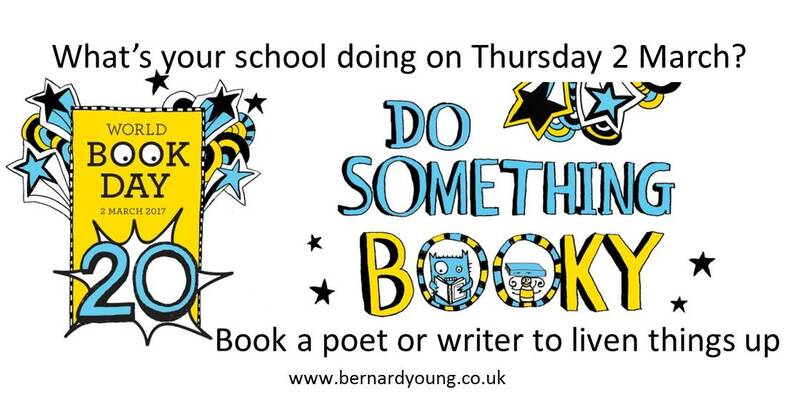 There is still time to book me for sometime around World Book Day. 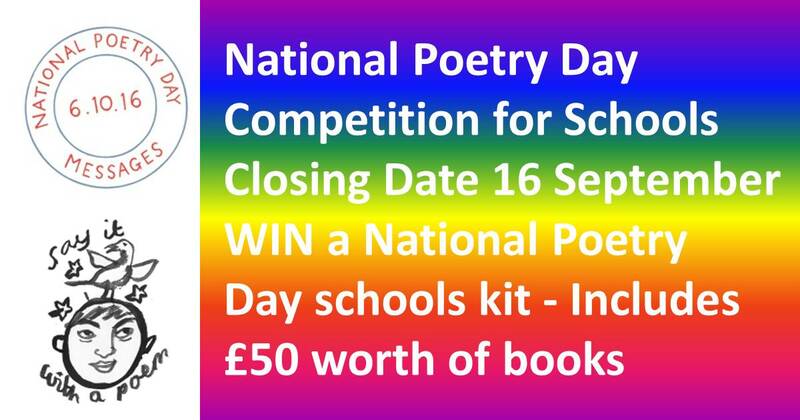 For an idea of how a day of poetry workshops can work in a school see here. If you are interested, please contact me to check availability and cost. What ever you do, I hope it is something booky! 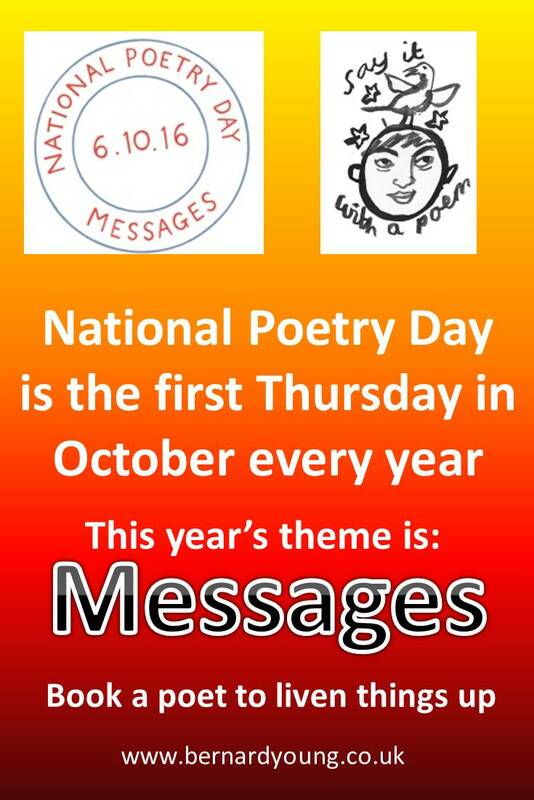 It’s a busy time for a poet this time of year, and for schools, what with dressing up and doing lots of reading and great creative writing. 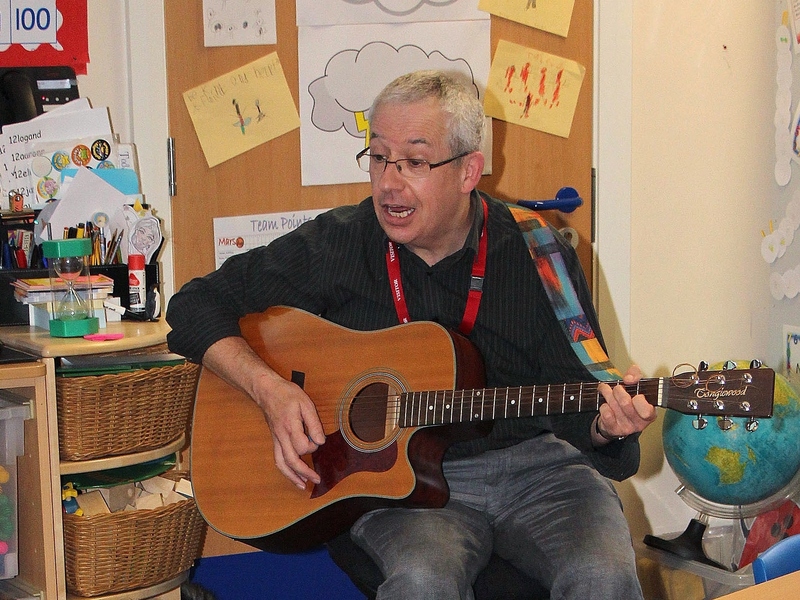 The poem in the photo (inspired by my I Like What I Like – see video below) was written with Nursery Children at Audenshaw Primary School, Manchester as a class effort. We performed it at the end of the day to the rest of the school. 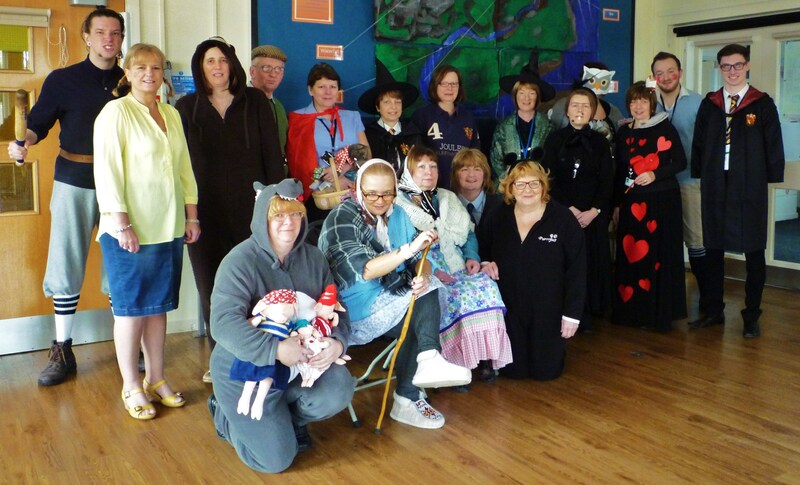 I was there to celebrate World Book Day 2016 and worked with every age group. A wide variety of excellent poems were written and performed. I had a great time, so thanks to all the staff and pupils for working so hard and for making me very welcome. In all I visited seven schools just before and during World Book Day Week. Thank you to Abingdon Primary School (Stockport), Gorton Mount Primary Academy (Manchester) who have a fantastic steel band who played for me, Old Hall Drive Primary Academy (Manchester), Alexandra Park Primary (Stockport), Broadfield Primary (Oldham), and (last but not least) Silverdale Primary Academy (Newcastle-under-Lyme). Thanks also to Authors Aloud who organised a couple of the bookings. On Monday I was happy to be visiting St Wilfred’s CE Primary School only 3 miles from where I live in Manchester. The day began in the hall where I gave a performance of poetry and music (great joining in from everyone) to the whole school. 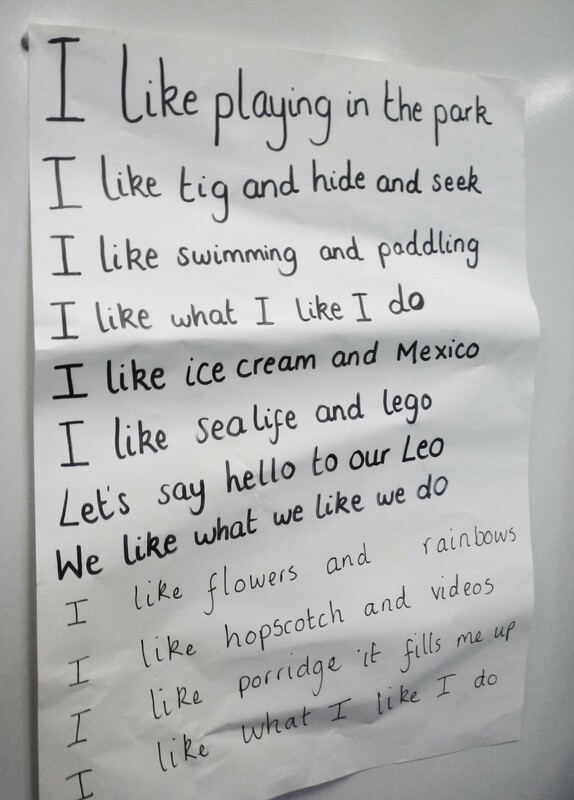 After that I joined Year 1 in their classroom where I played them ‘I Like What I Like.’ We then composed a version based on their likes and performed it together. By the end of the day I’d spent time with every class in the school (EYFS through to Year 6). 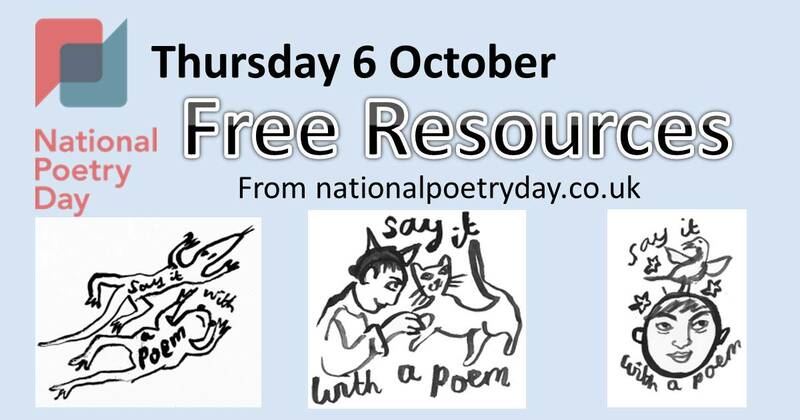 Loads of new poems got written – class poems, individual poems, poems written with a partner or in small groups (there was a class poem by Year 3 about a big golden bird – not sure where that came from! – which was performed to my guitar accompaniment). Thanks to all at St Wilfrid’s for the fun and enthusiasm and for a well organised day that whizzed by. 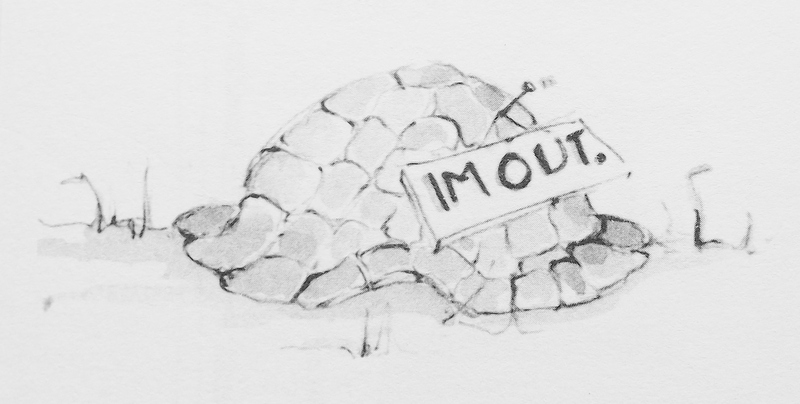 Hope to see you all again sometime. 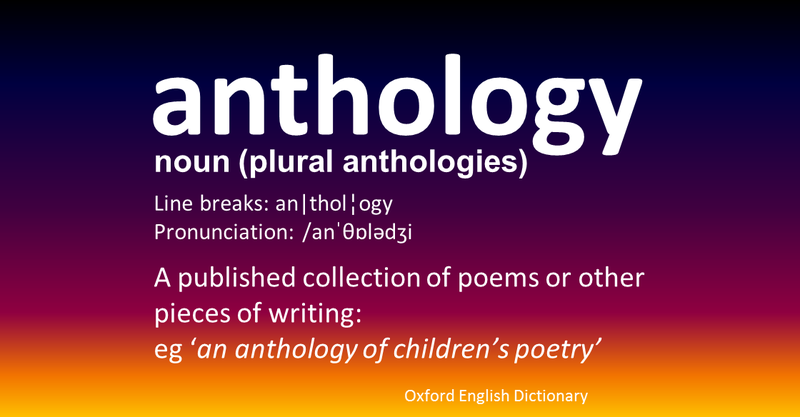 We’ve been doing some updating of the website, and as part of that a new page has been added with a few of the more recent anthologies that my poems have appeared in. The new page is here. 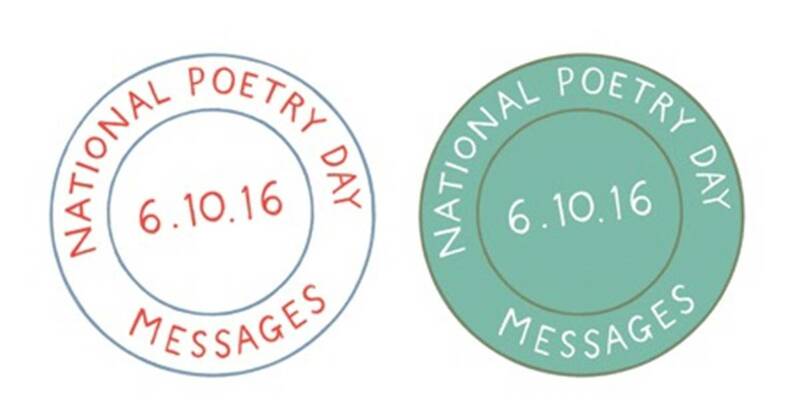 Generally poets get a one-off fee for a poem to appear in a collection such as these, and the books reference the person who selected the collection, as there is no editing involved. My work has appeared in a lot more than that list, but that gives a flavour, and there’s no point in pointing to books that are no longer easy to get hold of. 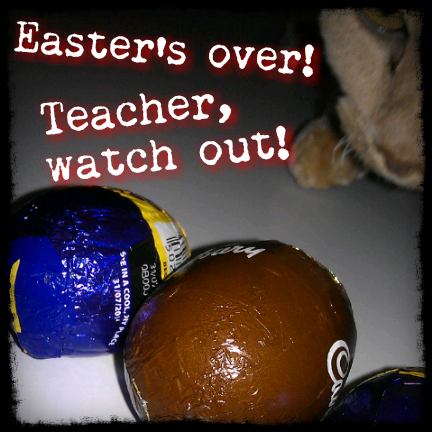 Easter is over! When you go back to school, teacher, watch out! This poem appears in Wanted Alive by Bernard Young.